Lord, make my life a living sacrifice to you! Language changes over the years. As time passes, generations of people speaking the same vocabulary can lose sight of the original meaning of a word or phrase and apply it to something else. The word “clue” for example, once referred to a ball of yarn. The original meaning was lost at some point and replaced with the definition we have today. How did it go from yarn to something that leads to solving a puzzle or mystery? Think of what would be great for helping people out of mazes. String laid out from a ball of yard leading to the exit would come in handy, right? With that specific use becoming familiar, the language adapted to the people and the word “clue” had a completely new meaning. This is a normal part of language development. Christian life is not immune to these adaptations. It is understood that we are not speaking like Cotton Mather, the Puritan Minister from the 1600’s. Yet, even in the midst of ongoing linguistic changes, it is important we do not lose sight of the Bible’s definitions of words and concepts. These never change no matter what the world is doing around us. The Bible is the eternal God’s eternal Word. It doesn’t adapt with the times, it is the Truth that the fallen world conforms to. It is important, therefore, that we know not only know the right words to say in our Christian vocabulary but also never lose sight of their meaning according to God’s dictionary. It is an amazingly important and powerful verse from an awesome man of God. We see it on T-shirts, as a life verse and hear it often in prayers. It is so familiar, the danger is our losing the actual meaning of Paul’s words. You may have heard this is as part of group prayer and thought, “Wow, that sounds right, a living sacrifice, I want to be that too”. This is great. It is an inspiring verse. The danger is when we take it and apply it only through our cultural or life filter. We apply it as spending time as an usher at church or reading the Bible in between our real life responsibilities. The church tends to associate it with the idea of service. Giving a bit of our life working in God related things is a good thing, of course. But Paul writes it as much more. It is not just setting aside service hours to fulfill a requirement. It is meant as an all-encompassing life statement. It is giving up everything we are and hope to be and giving it all to Jesus to be used as He sees fit. Everything – life, marriage, family, job, money, careers, sins – all submitted to God for direction. It is a dramatic exhortation from God’s Chosen Vessel. We have to look to the Old Testament to fully understand the imagery Paul is using to get to this conclusion. Through the Law of Moses, God sets up a system of worship for His chosen nation, Israel. It was based on the people offering sacrifices to God in the form of animals, crops, food, and drink. The people would express their gratitude, joy, and loyalty to God through the offerings at the Temple in Jerusalem. They would also sacrifice animals in their place to atone for their own sins. Here is where we get the picture of a living sacrifice. The Israelites would take a grain offering, a drink offering or an animal sacrifice from wherever they were living and bring it to the Temple. They took it to the altar and gave it completely to God. If it was an animal, it would be killed and either eaten or burned up. The same for a grain offering. A drink offering would be brought in a pitcher of some sort to the altar. It would be then poured out on the altar usually while an animal was burned. The smoke from the animal and the steam of the drink would mingle together and ascend from the altar into the heavens. Once sacrificed to God there was no returning the offering to the people. Even when they were allowed to consume some of it, this was merely part of the ritual not a retaining of ownership. The lamb was given over completely to God. Its life was given on the altar in service of God and His people. There is no going back for the lamb and it was not by its choice. Everything brought to God was given over completely to God out of worship of Him. The Old Testament physical realities often acted out the spiritual truths of New Testament believers. Now we no longer bring sheep and wheat to a physical altar, but according to Paul, we do still have a clear requirement to make a complete offering to God. In place of things that we grow, raise or create we are now required to give our lives up. We are the sacrifice. Our hearts, minds, and souls are offered to Jesus in place of a sheaf of grain, a lamb or a pitcher of wine. He asks for every part of us laid out for Him. Unlike the lamb, this is a completely voluntary decision on our part. It is an act of worship itself. Yet, because of the infinitely better relationship involved, the standard for us is so much higher than Old Testament Jews. 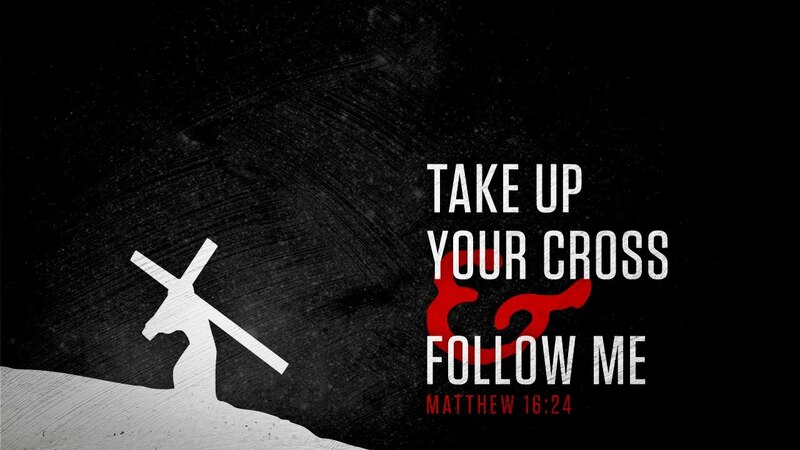 Jesus laid out everything for us on the Cross. His life offered in worship of God to invite us into the family of God. Serving a Savior who loved us so much He died for us is a privilege rather than a burden. In the Old Testament, the worshipper was also required to bring an animal at certain intervals from his world, his farm, into God’s presence to show his allegiance to God. The animal would be killed and the Israelite would leave the place of God and head back to their home. They came for a short time to experience the sacred but their lives were generally in the profane. No longer is this the case. 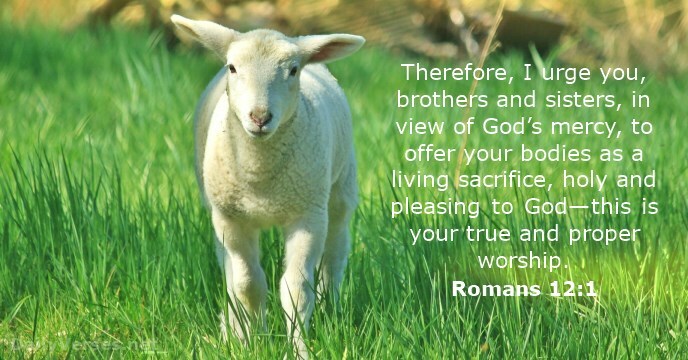 Now the follower of Jesus IS the sacrifice itself brought to God and offered wholly to Him as a sacrifice. Our whole lives are therefore sacred. There is no going back to just tending the farm if the farmer is offered up to Jesus. The offering itself is completely consumed during the process. The sacrifice does not end in death though. 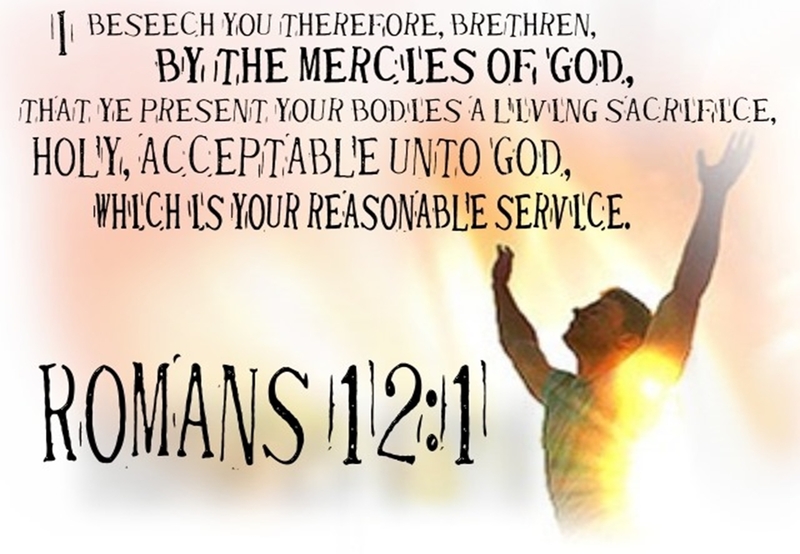 When Paul says it should be a living sacrifice this reinforces the continuing nature of the new relationship. It is not a limitation. A person does not need to physically die to be consecrated to God. It is ongoing as long as one lives. If we are to take this direction seriously, we compare our entire lives to the picture presented in the sacrificial system. Are we taking our bodies to Jesus every day and having it consumed as an offering to God? This does not mean that we are pastors, missionaries or professional ministry people. Rather, is our heart ready to be used by Jesus every moment of every day? Are we willing to let our own dreams and goals be burned up like the flesh of those long dead animals if it means trusting God will give us better achievements? 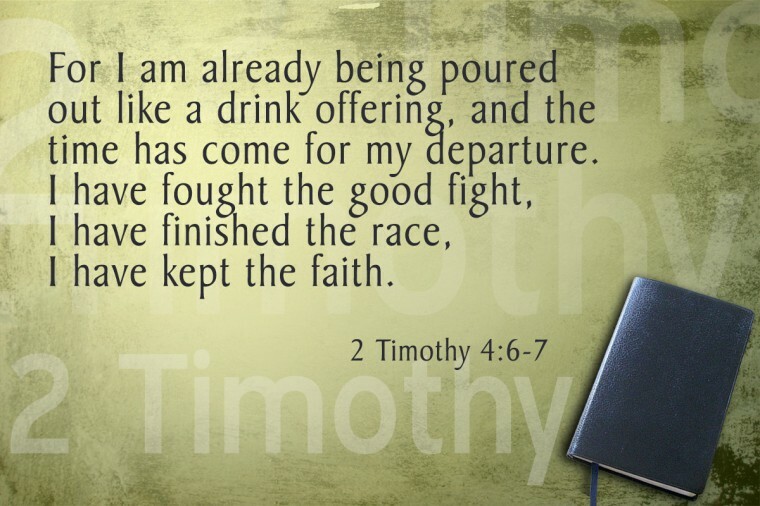 Are we being poured out like a drink offering? Is our strength, talent, money and time flowing like wine from a pitcher from us to God’s purposes so that it mingles with the sacrifice and rises up to heaven as a pleasant aroma to God? Is whatever we possess being offered completely to God for His Kingdom? Jesus wants all of us to be used to go about His business. It is an amazing privilege. It is quite a challenge. Jesus wants all of us for Him. If you liked this post, please consider joining us for Sunday mornings at Calvary Catonsville. We are a body of believers committed to following Jesus, studying God’s Word and loving each other well. ← Are We Loving Our Wives as Jesus Commands?